A Cardiac Myxoma (CM) is the most common type of primary cardiac tumour [1Butany J, Nair V, Naseemuddin A, Nair GM, Catton C, Yau T. Cardiac tumours: Diagnosis and management. Lancet Oncol 2005; 6(4): 219-28. [http://dx.doi.org/10.1016/S1470-2045(05)70093-0] [PMID: 15811 617] ]. Approximately more than half of primary cardiac tumours are myxomas [2Elbardissi AW, Dearani JA, Daly RC, et al. 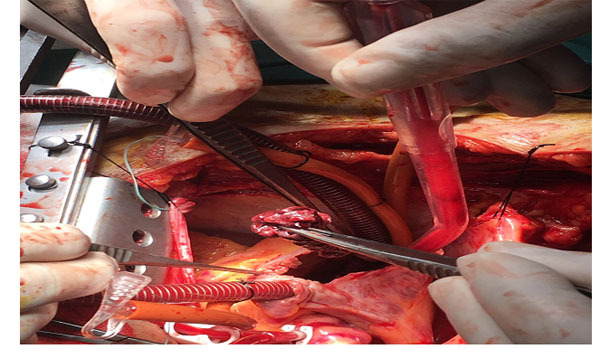 Survival after resection of primary cardiac tumors: A 48-year experience. Circulation 2008; 118(14)(Suppl. ): S7-S15. [http://dx.doi.org/10.1161/CIRCULATIONAHA.107.783126] [PMID: 18824 772] -5Pacini D, Careddu L, Pantaleo A, et al. Primary benign cardiac tumours: Long-term results. Eur J Cardiothorac Surg 2012; 41(4): 812-9. [http://dx.doi.org/10.1093/ejcts/ezr067] [PMID: 22219403] ]. They are most commonly diagnosed between the age of 30 and 60 years [5Pacini D, Careddu L, Pantaleo A, et al. Primary benign cardiac tumours: Long-term results. Eur J Cardiothorac Surg 2012; 41(4): 812-9. [http://dx.doi.org/10.1093/ejcts/ezr067] [PMID: 22219403] ]. CM is a sporadic or familial disorder [5Pacini D, Careddu L, Pantaleo A, et al. Primary benign cardiac tumours: Long-term results. Eur J Cardiothorac Surg 2012; 41(4): 812-9. [http://dx.doi.org/10.1093/ejcts/ezr067] [PMID: 22219403] , 6St John Sutton MG, Mercier LA, Giuliani ER, Lie JT. Atrial myxomas: A review of clinical experience in 40 patients. Mayo Clin Proc 1980; 55(6): 371-6. [PMID: 7382545] ]. A limited number of patients are referred with the classical triad of obstructive cardiac symptoms: pulmonary oedema, progressive heart failure (CHF) or arterial embolic events [6St John Sutton MG, Mercier LA, Giuliani ER, Lie JT. Atrial myxomas: A review of clinical experience in 40 patients. Mayo Clin Proc 1980; 55(6): 371-6. [PMID: 7382545] , 7Bakaeen FG, Reardon MJ, Coselli JS, et al. Surgical outcome in 85 patients with primary cardiac tumors. Am J Surg 2003; 186(6): 641-7. [http://dx.doi.org/10.1016/j.amjsurg.2003.08.004] [PMID: 14672772] ]. Rarely, syncope/vertigo or sudden death can be the first symptom of a CM [6St John Sutton MG, Mercier LA, Giuliani ER, Lie JT. Atrial myxomas: A review of clinical experience in 40 patients. Mayo Clin Proc 1980; 55(6): 371-6. [PMID: 7382545] -9Patil NP, Dutta N, Satyarthy S, Geelani MA, Kumar Satsangi D, Banerjee A. Cardiac myxomas: Experience over one decade. J Card Surg 2011; 26(4): 355-9. [http://dx.doi.org/10.1111/j.1540-8191.2011.01271.x] [PMID: 21793 921] ]. For early diagnosis, transthoracic echocardiography (TTE) is increasingly used. Magnetic resonance imaging (MRI) and/or thoracic Computed Tomography (CT) have also been used. Early and optimal surgical excision have shown excellent early and long-term results, with no recurrence of the tumour [10Keeling IM, Oberwalder P, Anelli-Monti M, et al. Cardiac myxomas: 24 years of experience in 49 patients. Eur J Cardiothorac Surg 2002; 22(6): 971-7. [http://dx.doi.org/10.1016/S1010-7940(02)00592-4] [PMID: 12467 822] -12Yu K, Liu Y, Wang H, Hu S, Long C. Epidemiological and pathological characteristics of cardiac tumors: A clinical study of 242 cases. Interact Cardiovasc Thorac Surg 2007; 6(5): 636-9. [http://dx.doi.org/10.1510/icvts.2007.156554] [PMID: 17670730] ]. According to previous publications [13Wens R, Goffin Y, Pepys MB, et al. Left atrial myxoma associated with systemic AA amyloidosis. Arch Intern Med 1989; 149(2): 453-4. 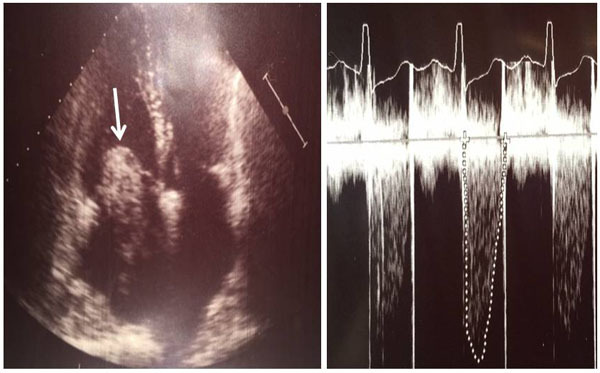 [http://dx.doi.org/10.1001/archinte.1989.00390020141031] [PMID: 29 16891] -16Bushnell JR, Weston C, Karamadoukis L. An unusual presentation of atrial myxoma with haematuria and proteinuria. NDT Plus 2011; 4(2): 124-5. [PMID: 25984131] ] CMs are diagnosed sporadically in 90% of patients. In contrast to solid CMs, papillary CMs are characterized by a soft formation which is friable during the excision. Therefore, the rate of recurrence is higher in patients with papillary CMs compared with the solid type. Two patients with CM were 13 and 17 years old; 11 patients had chest pain and respiratory discomfort on exertion; 7 patients had a history of early fatigue during walking. Non-specific findings such as anaemia, weight loss, cough, and fever were detected in 6 patients. None of the patients had a family history or Carney complex [12Yu K, Liu Y, Wang H, Hu S, Long C. Epidemiological and pathological characteristics of cardiac tumors: A clinical study of 242 cases. Interact Cardiovasc Thorac Surg 2007; 6(5): 636-9. [http://dx.doi.org/10.1510/icvts.2007.156554] [PMID: 17670730] -17Gururani K, Kumar P. Unusual presentation of left atrial myxoma. BMJ Case Rep 2016; 2016: 2016. [PMID: 27587750] ] which is characterized by spotty skin pigmentation, endocrine overactivity and myxomas [15Takeishi M, Mimori A, Adachi D, Arai E, Suzuki T. Case of fulminant mixed cryoglobulinemia developing after atrial myxoma resection. Nihon Rinsho Meneki Gakkai Kaishi 2001; 24(4): 168-74. [http://dx.doi.org/10.2177/jsci.24.168] [PMID: 16578968] -18Obrenović-Kirćanski B, Mikić A, Parapid B, et al. A 30-year single-center experience in atrial myxomas: From presentation to treatment and prognosis. Thorac Cardiovasc Surg 2013; 61(6): 530-6. [PMID: 22865091] ]. Pathological classification showed solid (sessile) CMs in 18 patients (47.3%); papillary CMs were detected in the other 20 patients. The most common site was the left atrium. Left atrial and interatrial septal defect were common. Classification of the patients according to tumour implantation area, medication, and the risk factors such as tumour size are summarised in Table 2. Preoperative characteristics of the patients with cardiac myxoma. Classification of patients according to tumour implantation area. Additional cardiac surgery concomitant with myxoma resection. Age distribution of 38 patients who had cardiac myxomas. We used two-dimensional TTE for diagnosis in all patients (Figs. 1 and 2 ). If tumours other than CMs were suspected, thoracic CT or MRI were used. Coronary angiography was performed routinely in patients with a history of chest pain or older than 45 years. Symptomatic cardiac arrhythmias were described as: non-sustained and sustained ventricular tachycardia, sustained supraventricular tachycardia (atrial flutter or AF) and a frequent ventricular ectopic beats. Early post-operative mortality was defined as death in hospital or within 30 days after surgery. After discharge, physical examinations, electrocardiograms, chest radiographs, and echocardiograms were performed at 6 months, and thereafter every year. If we suspected a recurrence, we performed a TTE and/or MRI. 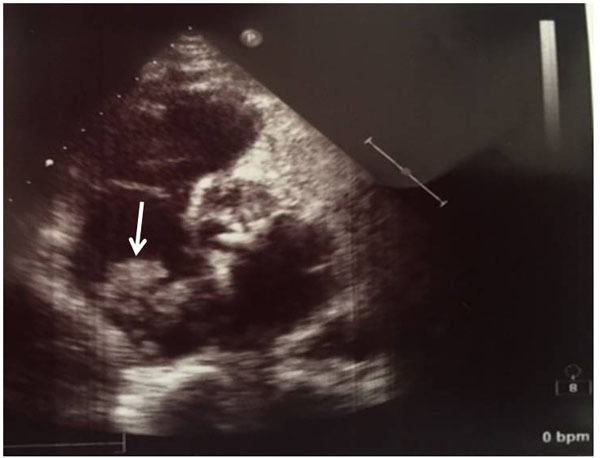 Transthoracic echocardiography shows an atrial myxoma (white arrow) which caused mitral valve stenosis in a young male patient with congestive heart failure. Because the tumour was large and close to the mitral posterior leaflet, it caused valve stenosis during systole. Two dimensional transthoracic echocardiography demonstrates a huge left atrial myxoma attached to the interatrial septum and prolapsing into the left ventricle during diastole. Mitral valvular stenosis and moderate mitral valvular insufficiency in a female patient (white arrow). Continuous doppler image of mitral valvular stenosis indicating a peak pressure difference of >67 mmHg between the left atrium and left ventricle. Mitral, tricuspid or aortic valve repair were performed in 5 patients. De Vega annuloplasty or Key Annuloplasty was performed (Figs. 3a and b ). 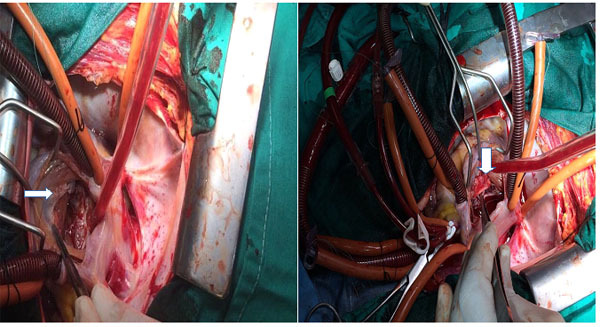 In 2 patients with atrial CM concomitant with coronary artery disease, we performed coronary artery bypass grafting. Shows the right atrium. After resection of myxoma from interatrial septum. The white arrow head demonstrates the excised tricuspid leaflet (section A). After repair of the tricuspid valve using pericardium (white arrow head) no impairment was detected (section B). Demonstrates a sessile giant atrial myxoma mimicking an atrial thrombus which caused tricuspid valve stenosis in a patient with chest pain and dyspnoea. 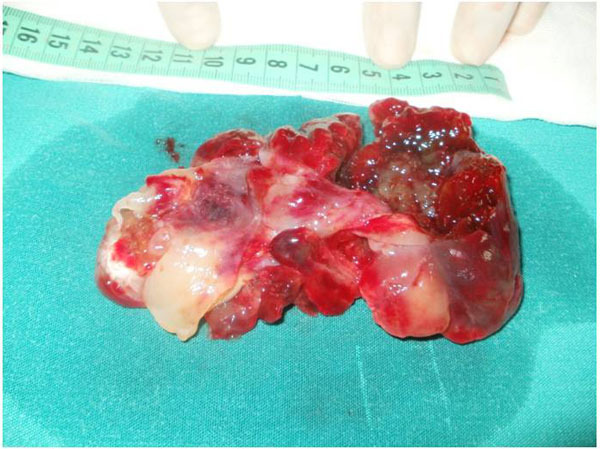 Images of a huge myxoma. The resected myxoma had a broad base of approximately 7 cm in diameter (length of myxoma was approximately 13 cm). Histologic examinations showed pericardial invasion by a CM in 1 patient. During the operation, adhesions of pericardial sac was released from the myocardium. The CM extended into the inferior vena cava. There was a large solid tumour (length 13 cm.) (Fig. 4 ) Histologic examination demonstrated a polypoid lesion composed of stellate cells in a myxoid vascular stroma, with no atypia seen, in keeping with a benign atrial CM (Fig. 5 ) Typically, the pathological changes observed included proliferation of capillaries, blood extravasation, and disseminated fibrin deposits (Fig. 6 ). The average dimension of the resected CMs was 3.9 ± 1.1 cm (median, 4.9 cm; range: 2.8-13.0 cm). This high power microscopic appearance of a cardiac myxoma demonstrates minimal cellularity. Only scattered spindle cells with scant pink cytoplasm (arrowheads) are present in a loose myxoid stroma. Microscopic investigation of pericardium in a patient with nephrotic syndrome and pericarditis (A). This picture shows an invasion of pericardium by a huge myxoma (B). 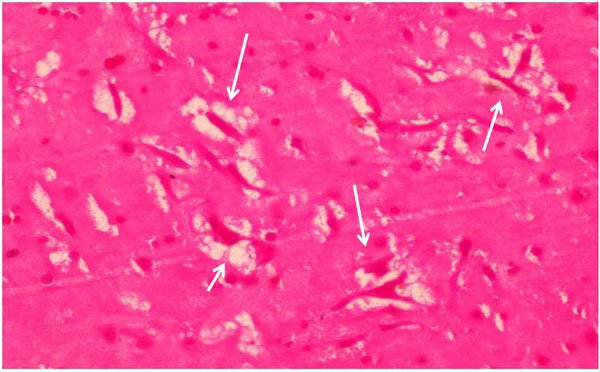 Scattered spindle cells with scant pink cytoplasm and intrapericardial haemorrhagic areas are present (C). Mean tumour dimension was 2.1±0.4 cm (median: 2.3 cm) (range: 1.6-13 cm). Histologic examinations including embolic material showed that cardiac tumours contained a myxoid stroma with isolated round and spindle cells. Multinucleated cells were occasionally seen. The surface of cells were polygonal and in a monolayer. Macrophages, lymphocytes, and plasma cells were noted. Haemorrhagic areas were commonly found, in both CM types. Microscopic investigation of pericardium in a patient with nephrotic syndrome and pericarditis showed an invasion of pericardium by a myxoma included scattered spindle cells with scant pink cytoplasm and intrapericardial hemorrhgia (Fig. 7 ). Malignant or beningn primary cardiac tumors are rare. The prevalence of cardiac tumors ranges from 0.0013% to 0.3% [4Lee SJ, Kim JH, Na CY, Oh SS. Eleven years’ experience with Korean cardiac myxoma patients: Focus on embolic complications. Cerebrovasc Dis 2012; 33(5): 471-9. [http://dx.doi.org/10.1159/000335830] [PMID: 22517375] -11Wang JG, Li YJ, Liu H, Li NN, Zhao J, Xing XM. Clinicopathologic analysis of cardiac myxomas: Seven years’ experience with 61 patients. J Thorac Dis 2012; 4(3): 272-83. [PMID: 22754666] ]. Myxoma is the commonest bening cardiac tumor (50% of all benign cardiac tumors). The aetiology of CMs is not clearly understood. The tumours may originate from primitive mesenchymal stem cells which have a capacity to differentiate along endothelial lines [9Patil NP, Dutta N, Satyarthy S, Geelani MA, Kumar Satsangi D, Banerjee A. Cardiac myxomas: Experience over one decade. J Card Surg 2011; 26(4): 355-9. [http://dx.doi.org/10.1111/j.1540-8191.2011.01271.x] [PMID: 21793 921] ]. However, some markers suggest that intracardiac sensory nerve tissue can be the origin of CMs [10Keeling IM, Oberwalder P, Anelli-Monti M, et al. Cardiac myxomas: 24 years of experience in 49 patients. Eur J Cardiothorac Surg 2002; 22(6): 971-7. [http://dx.doi.org/10.1016/S1010-7940(02)00592-4] [PMID: 12467 822] -12Yu K, Liu Y, Wang H, Hu S, Long C. Epidemiological and pathological characteristics of cardiac tumors: A clinical study of 242 cases. Interact Cardiovasc Thorac Surg 2007; 6(5): 636-9. [http://dx.doi.org/10.1510/icvts.2007.156554] [PMID: 17670730] ]. Our experience of CMs patients including age, gender ratio, type of CMs (papillar or solid), tumour location and clinical presentations were similar when compared with previous reports [4Lee SJ, Kim JH, Na CY, Oh SS. Eleven years’ experience with Korean cardiac myxoma patients: Focus on embolic complications. Cerebrovasc Dis 2012; 33(5): 471-9. 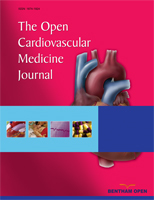 [http://dx.doi.org/10.1159/000335830] [PMID: 22517375] -12Yu K, Liu Y, Wang H, Hu S, Long C. Epidemiological and pathological characteristics of cardiac tumors: A clinical study of 242 cases. Interact Cardiovasc Thorac Surg 2007; 6(5): 636-9. [http://dx.doi.org/10.1510/icvts.2007.156554] [PMID: 17670730] ]. The majority of our patients were adults, except for 2 paediatric patients. Unlike previous publications, our series identified that proteinuria or renal failure may rarely be a first clinical presentation in these patients. Previous studies demonstrated that CMs may be associated with some urinary abnormalities [13Wens R, Goffin Y, Pepys MB, et al. Left atrial myxoma associated with systemic AA amyloidosis. Arch Intern Med 1989; 149(2): 453-4. [http://dx.doi.org/10.1001/archinte.1989.00390020141031] [PMID: 29 16891] ] like membranous nephropathy [13Wens R, Goffin Y, Pepys MB, et al. Left atrial myxoma associated with systemic AA amyloidosis. Arch Intern Med 1989; 149(2): 453-4. [http://dx.doi.org/10.1001/archinte.1989.00390020141031] [PMID: 29 16891] ], renal amyloidosis [14Metz-Kurschel U, Wehr M. Atrial myxoma and signs of autoimmune disease. Dtsch Med Wochenschr 1989; 114(5): 181-3. [http://dx.doi.org/10.1055/s-2008-1066573] [PMID: 2914559] ], interstitial nephritis [15Takeishi M, Mimori A, Adachi D, Arai E, Suzuki T. Case of fulminant mixed cryoglobulinemia developing after atrial myxoma resection. Nihon Rinsho Meneki Gakkai Kaishi 2001; 24(4): 168-74. 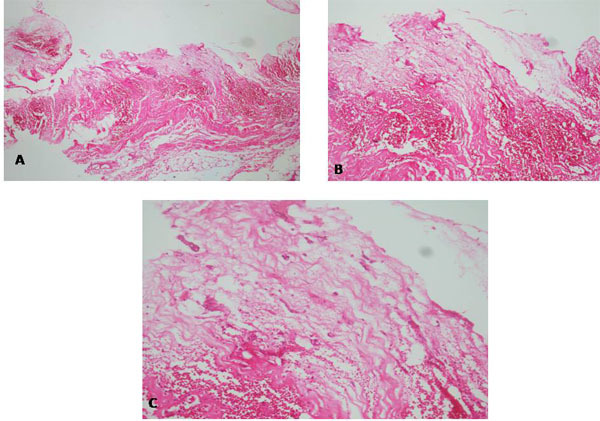 [http://dx.doi.org/10.2177/jsci.24.168] [PMID: 16578968] ] and cryoglobulinaemia [16Bushnell JR, Weston C, Karamadoukis L. An unusual presentation of atrial myxoma with haematuria and proteinuria. NDT Plus 2011; 4(2): 124-5. [PMID: 25984131] ]. The authors hypothesised that an antiendothelial cell antibodies might cause endothelial cell activation, apoptosis and cytotoxicity in the cardio-renal system. It is presumed that CMs can cause local activation of the immune system which allows the production of autoantibodies. Indeed, animal models showed the development of antiendothelial cell antibodies might cause severe proteinuria resulting from renal injury [17Gururani K, Kumar P. Unusual presentation of left atrial myxoma. BMJ Case Rep 2016; 2016: 2016. [PMID: 27587750] , 18Obrenović-Kirćanski B, Mikić A, Parapid B, et al. A 30-year single-center experience in atrial myxomas: From presentation to treatment and prognosis. Thorac Cardiovasc Surg 2013; 61(6): 530-6. [PMID: 22865091] ]. Ventricular tachyarrhythmia or peripheral or cerebral artery embolic events can be the primary symptom. Of the 38 patients retrospectively reviewed in our series, 13.1% had arterial embolic events [16Bushnell JR, Weston C, Karamadoukis L. An unusual presentation of atrial myxoma with haematuria and proteinuria. NDT Plus 2011; 4(2): 124-5. [PMID: 25984131] -25Rafajlovski S, Ilić R, Gligić B, et al. Diagnosis and results of treatment of heart myxoma. Vojnosanit Pregl 2011; 68(10): 851-5. [http://dx.doi.org/10.2298/VSP1110851R] [PMID: 22165750] ]. Dyspnoea presented as the predominant obstructive cardiac manifestations in our series. In rare patients, some of the mediastinal masses can be misdiagnosed as CM because of cardiac external compression [26Owers CE, Vaughan P, Braidley PC, et al. Atrial myxomas: A single unit’s experience in the modern era. Heart Surg Forum 2011; 14(2): E105-9. [http://dx.doi.org/10.1532/HSF98.20091163] [PMID: 21521672] ]. Magnetic resonance or computed tomography may provided the more detailed definition compared with TTE together with their extension to mediastinal structures [26Owers CE, Vaughan P, Braidley PC, et al. Atrial myxomas: A single unit’s experience in the modern era. Heart Surg Forum 2011; 14(2): E105-9. [http://dx.doi.org/10.1532/HSF98.20091163] [PMID: 21521672] -29Cetin G, Gursoy M, Ugurlucan M, et al. Single-institutional 22 years experience on cardiac myxomas. Angiology 2010; 61(5): 504-9. [http://dx.doi.org/10.1177/0003319709352489] [PMID: 20042418] ]. TTE and TEE have a high sensitivity with detection rates reported to be nearly 100% [27Lin YS, Jung SM, Wu HH, et al. Survivin expression in cardiac myxoma. Chang Gung Med J 2011; 34(4): 360-6. [PMID: 21880190] -29Cetin G, Gursoy M, Ugurlucan M, et al. Single-institutional 22 years experience on cardiac myxomas. Angiology 2010; 61(5): 504-9. [http://dx.doi.org/10.1177/0003319709352489] [PMID: 20042418] ]. In patients with CM, we suggest intraoperative TEE to identify intracardiac tumour metastasis and assess the results of valvuloplasty procedures during surgery. Median sternotomy or right anterior thoracotomy provides an adequate mitral or tricuspid valve exposure for cases involving small or large CMs [30Oliveira R, Branco L, Galrinho A, et al. Cardiac myxoma: A 13-year experience in echocardiographic diagnosis. Rev Port Cardiol 2010; 29(7-8): 1087-100. [PMID: 21066964] -34Lee VH, Connolly HM, Brown RD Jr. Central nervous system manifestations of cardiac myxoma. Arch Neurol 2007; 64(8): 1115-20. [http://dx.doi.org/10.1001/archneur.64.8.1115] [PMID: 17698701] ]. Recently, minimal invasive surgery with the guidance of a thoracoscope has been described for the treatment of intracardiac tumours [35Braun S, Schrötter H, Reynen K, Schwencke C, Strasser RH. Myocardial infarction as complication of left atrial myxoma. Int J Cardiol 2005; 101(1): 115-21. [http://dx.doi.org/10.1016/j.ijcard.2004.08.047] [PMID: 15860393] , 36Kumar N, Agarwal S, Ahuja A, Das P, Airon B, Ray R. Spectrum of cardiac tumors excluding myxoma: Experience of a tertiary center with review of the literature. Pathol Res Pract 2011; 207(12): 769-74. [http://dx.doi.org/10.1016/j.prp.2011.09.014] [PMID: 22078057] ]. We used a right anterior thoracotomy for resection of CMs in some patients without any complication. In our opinion, our series will support the minimal invasive technique. Our experiences showed that annuloplasty or valve replacement with the use of minimal invasive approach may be performed safely. In this technique, we used the right anterior minithoracotomy incision using with femoral artery and central venous cannulation. We operated the patients with the use of normothermic or mild hypothermic cardiopulmonary circulation. If we needed bicaval cannulation, we used special designed central venous cannula underwent TEE. In agreement with previous publications, a higher risk of perioperative complications would be expected in patients with NHYA Class-III and IV [37Miyake CY, Del Nido PJ, Alexander ME, et al. Cardiac tumors and associated arrhythmias in pediatric patients, with observations on surgical therapy for ventricular tachycardia. J Am Coll Cardiol 2011; 58(18): 1903-9. [http://dx.doi.org/10.1016/j.jacc.2011.08.005] [PMID: 22018302] -39Müller S, Feuchtner G, Bonatti J, et al. Value of transesophageal 3D echocardiography as an adjunct to conventional 2D imaging in preoperative evaluation of cardiac masses. Echocardiography 2008; 25(6): 624-31. [http://dx.doi.org/10.1111/j.1540-8175.2008.00664.x] [PMID: 18652 008] ]. Because familial forms of CM have been reported, we recommend that the patients’ family have long-term echocardiography follow-up [40Engberding R, Daniel WG, Erbel R, et al. Diagnosis of heart tumours by transoesophageal echocardiography: A multicentre study in 154 patients. Eur Heart J 1993; 14(9): 1223-8. [http://dx.doi.org/10.1093/eurheartj/14.9.1223] [PMID: 8223737] -44Zheng JJ, Geng XG, Wang HC, Yan Y, Wang HY. Clinical and histopathological analysis of 66 cases with cardiac myxoma. Asian Pac J Cancer Prev 2013; 14(3): 1743-6. [http://dx.doi.org/10.7314/APJCP.2013.14.3.1743] [PMID: 23679267] ]. Lin et al. demonstrated that solid CMs were associated with more arrhythmias [45Lin Y, Xiao J, Chen J, et al. Treating cardiac myxomas: A 16-year Chinese single-center study. J Cardiovasc Med (Hagerstown) 2016; 17(1): 44-53. [http://dx.doi.org/10.2459/JCM.0000000000000114] [PMID: 2493 3197] ].